Republicans on the House Permanent Select Committee on Intelligence asked President Donald Trump in a June 14 letter to declassify and release 21 pages from one of the applications for a spy warrant against former Trump campaign adviser Carter Page. The Republicans do not specify why they identified the 21 pages in particular, but the request suggests they believe that the heavily redacted pages contain evidence the FBI and Department of Justice misled a federal judge in its application for the Page Foreign Intelligence Surveillance Act (FISA) warrant. “In the course of the Committee’s investigation, we have uncovered irregularities with the process by which DOJ and FBI obtained information and sought and renewed three times a warrant pursuant to FISA on U.S citizen Carter Page,” reads the letter, which was first reported by Fox News. The applications also assert that Page acted as a foreign agent of Russia while he was on the Trump campaign. The Republicans identified pages 10-12 and 17-34 of the final FISA granted against Page, which was approved in June 2017. Deputy Attorney General Rod Rosenstein and then-Deputy FBI Director Andrew McCabe signed off on the application, which is 121 pages in all. That section begins with allegations about Page provided to the FBI by a confidential human source who closely matches Christopher Steele, the former British spy who authored the dossier. 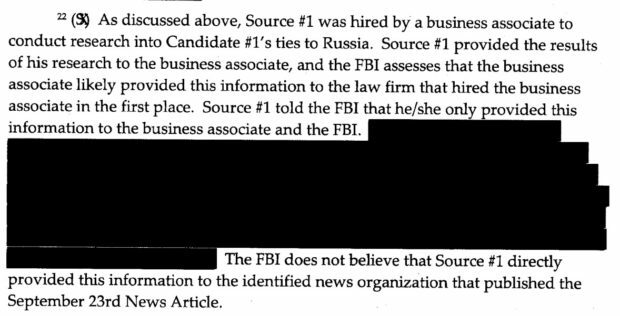 Unredacted footnotes in that section also reveal that the FBI cut ties with Steele in October 2016 after he made unauthorized disclosures to the media. The government said it would overlook Steele’s actions because he had been a “reliable” source in the past. The third section identified by House Republicans includes a lengthy review of a Sept. 23, 2016 article in Yahoo! News about Page. The article, written by Michael Isikoff, has become one of the more contentious components of the FISA applications. That’s because the FISA applications do not acknowledge that Steele was a source for Isikoff. Republicans have argued that the FBI relied on information sourced to Steele to help support Steele’s dossier allegations. But supporting Republicans’ argument is that the subsection presents allegations from Isikoff’s article in a way that suggests that the information was derived independently from Steele. Pictured is a section from the Carter Page FISA warrant application.